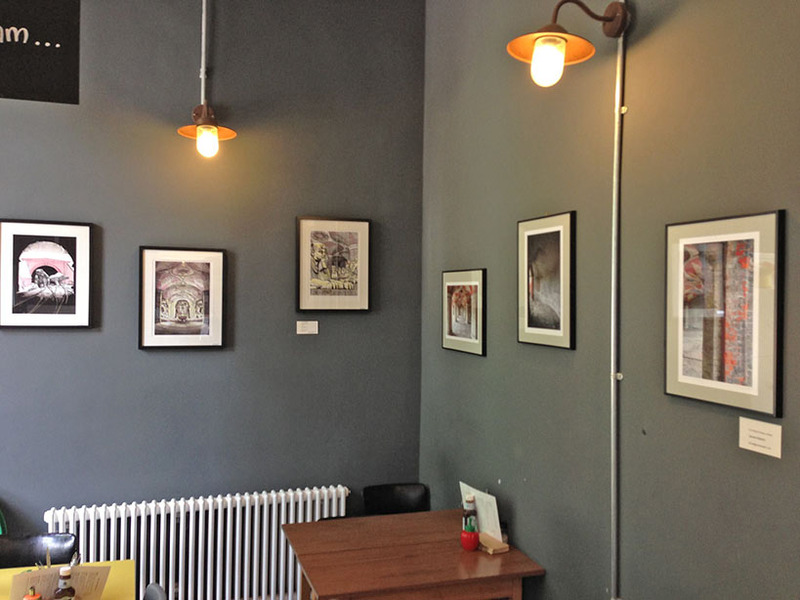 Photographer James Balston and I installed our mini exhibition of prints, this week, at Brown and Green Café, Crystal Palace Station. All the work is related to the Crystal Palace area. My stuff has been inspired by the dinosaur and sphinx sculptures in Crystal Palace Park and the disused subway as mentioned many a time on this blog. James' photos are of the subway itself, and really capture the lovely (if unloved) Victorian brickwork down there. Lucky ballot winners for the Open House Weekend (21st September) will be able to visit the structure later next month. James and I were really lucky to be granted access when we did. All the works are for sale. My prints can be bought here: bannisterimages.bigcartel.com, and James can be contacted via his websites here: jamesbalston.squarespace.com or thetrianglese19.blogspot.co.uk. That's not me buying a coffee but if you look, you can see James in the distance behind the cakes.